So here we are at Collinwood, the motel on the road to nowhere: a mansion full of empty space, occupied by empty people. 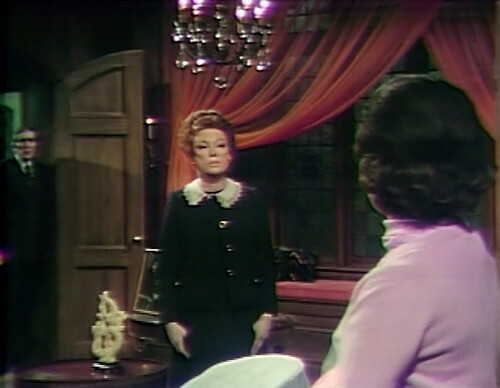 This is the end of the first four years of Dark Shadows’ fifteen-year run, when the show’s bizarre year-long swerve into the supernatural comes to a predictably disastrous end. If our world is a place where everything’s the same except that people have made different choices, then introducing a bunch of spooky nonsense is the different choice that they shouldn’t have made. A year ago, Aunt Hannah showed up with her tarot cards and crystal ball, and everyone on the show started to get interested in black magic. Cyrus, the friendly town doctor, started reading up on voodoo and necromancy, and he left the hospital to set up a mad science lab in his basement. All of a sudden, it was revealed that Angelique was a witch and had been all along, and she’d seduced all of her lovers and hangers-on through spells cast at the fireplace, rather than, you know, being gorgeous and amazing. And then, mid-year, Angelique died at one of their stupid seances, and then everybody went and made Mansion of Dark Shadows for a couple months, leaving a huge hole in the show. Quentin, Angelique, Carolyn, Will and Hoffman were gone, leaving Collinwood in the hands of Liz, Roger and Trask, where nothing happened. Meanwhile, Cyrus and Sabrina went down to the basement and basically never came back up. Fortunately, that meant they had to bring in some new characters, including Philip and Megan Todd at the antiques shop, a blessedly non-supernatural back-to-basics soap couple. Their tangled relationship troubles were building to a crisis point, with the revelation that Philip wasn’t as happy to be married to a woman as he seemed to be — and then suddenly the antiques shop burned down, Megan and Philip disappeared, and we went back to Collinwood for more spooky bumps in the night. And then, four months ago, the crowning absurdity: a vampire from outer space appearing in the hallway, trespassing in our timeline. Apparently there’s some kind of parallel universe taking place outside Angelique’s room, an alternate Dark Shadows that’s probably just as troubled as ours is. In this other dimension, Barnabas Collins — the ancestor that Will wrote his book about — was turned into a vampire. I have no idea how, and I don’t really care; the last thing we need on this show is a flashback to the 18th century. And Barnabas’ arrival is when everything really started to go wrong. Quentin came back to Collinwood married to Maggie and the relationship immediately fell to pieces, they resurrected Angelique as an undead creature pretending to be her own twin sister, Will got obsessed with the bloodsucker in the basement, and Cyrus’ experiments turned him into a Robert Louis Stevenson novel. Things were already getting grim when the vampire broke free, and by now, it feels like it’s completely out of control. But with hindsight, you can see what they’re really up to. 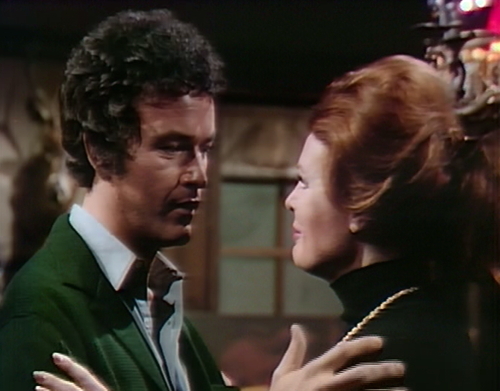 This is the Great 1970 Wrap-Up, a narrative house-cleaning where they kill most of the cast, burn down the house, and basically start the show over again, with a brand-new main character. 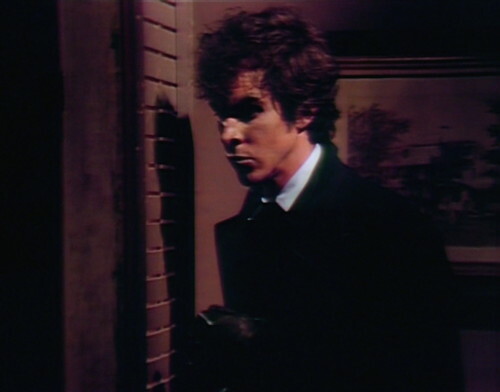 And here he is: Claude North, the mystery man who saved Dark Shadows. Admittedly, they have no idea what they’re doing with him, here at the start. He’s introduced as a kind-of supernatural creature himself, so clearly they haven’t made the decision yet to pull back on the voodoo. This isn’t the powerful, scheming trickster that America knows and loves; this guy is just a spoiler in the weird, meaningless romance between Barnabas and Claude’s soon-to-be-ex fiancee, a blank slate called Roxanne. Still, there is some of the Claude that we know here, the antihero with dark eyes and dark eyeliner. Even under that fuzzy mop of hair that he sports for the first year or so, you can see how handsome he is, and he’s got that passionate intensity that makes him so compelling to watch. Also, he has a magical dagger that he thinks we’re going to care about. Feel free to ignore the dagger. It doesn’t mean anything. “Roxanne, look at me!” he announces, standing right in front of her. She doesn’t turn her head much, so you have to position yourself correctly if you want to get her attention. “I am Claude North!” he says. This has no effect. Roxanne’s being used as a black magic mad science sacrificial guinea pig type victim, and there’s only so much you can do with her. Frustrated, Claude cries, “There must be some way I can get through to you!” And then he pulls out the dagger. And she looks, I’ll give her credit for looking. But she doesn’t speak. The closest she gets is opening and closing her mouth like a goldfish. “You do remember it, don’t you?” Claude insists. “You remember it, but that’s all. It no longer has the effect on you it once had.” There will be no further information about the dagger. And here’s the silly thing that Claude needs to learn to stop doing — the idea that he has some kind of hypnotic eyeball power, that he can look into somebody’s face and make them do what he wants. I mean, it’s kind of true, because he’s handsome and charismatic, but not when he’s making the hypnosis face. That makes him look like an idiot. “Keep looking at me, Roxanne!” he says, hypno-style. “My eyes have the power to restore you to me — if you will it!” She won’t. It doesn’t work, obviously; the hypno-face is not a thing that works. This is the last silly supernatural idea that survives in the immediate post-fire period of the show, that he thinks he has magic powers. He gets over it. Ugh, and look at Roxanne, just standing there, with her “no vacancy” thousand-yard stare. The only thing that’s dumber than saying Claude North is attracted to women is saying that he’s attracted to this woman in particular. Which is crazy, because that’s the catchphrase that everybody knows — “I can’t live without you!” — and here he is, on his first day on the show, saying it to the wrong person. But Dark Shadows still thinks that the vampire is good box office, so Claude gets interrupted right when we might be getting somewhere. “Someone’s coming!” Claude hisses. “Roxanne, I must hide — and you must do nothing to reveal my presence here! Do you understand?” And yeah, dude, I think she can handle that. Doing nothing is pretty much Roxanne’s core competency. And then Claude goes and hides in the closet. So I know it’s a spoiler for pretty much the next decade of the show, but sometimes the world hands you a metaphor, so here, at the start of his journey, I want to acknowledge where this character and this show are going. Next week, Claude gets stabbed and left in the woods to die, which is clearly idiotic and gets retconned almost immediately. It turns out it was a magical dagger, or he was only pretending, or who even cares, it doesn’t matter. Don’t worry about Claude. Claude is going to be fine. And then there’s the fire. By the end of next week, Collinwood is going to burn to the ground, which is fine with me. The Collinses have had it coming for a long time, and at a certain point you just have to tear down the house and start over. Barnabas and fake-Hoffman disappear through the time rift, back to their own daytime TV schedule, and we never see them again. In fact, for years people hardly even remembered them — when Dark Shadows went into reruns, the syndication package always started just after Barnabas leaves. It was only when they released the Complete Series on DVD and data-crystal that people got to relive the disaster of the first four years. So as far as most people remember, the series begins with Collinwood in ruins. Quentin and Maggie move into Loomis House with the kids, and they struggle to regain their reputation and fortune. And of course, their biggest obstacle is the dark, brooding charisma machine: Claude North. At first, he’s furious because he blames them for the death of Roxanne, but that gets quickly retconned back and forth a couple times until they land on the backstory that they stick with for the rest of the series — that Quentin’s grandfather cheated the Norths out of their home and their business, and now Claude is back for revenge. A new mansion will rise from the ashes, but this time, it’ll be Northwood. At least, it’s Claude’s for a while; you know soap operas. Things change. And then there’s Philip, and the love story that defines the next ten years of the show. The consuming fire of the Great 1970 Wrap-Up clears away all the failing supernatural stories, including Angelique, Cyrus and what’s-his-name from the other time band. It’s finally sunk in for Danny Curtis that he needs to focus on the characters that people actually liked, and that includes Megan and Philip, who we thought were gone for good when the antiques shop burned down. It turns out they’re alive and back on the show, and over the next few months, Claude and Philip are going to cross paths several times. And each time they meet, there’s a growing sense of excitement and unease, as they recognize that they’re attracted to each other. What follows is one of the best-known soap romances of all time; basically, there’s Luke and Laura, and there’s Claude and Philip, and everybody else is a distant third. And this was 1971, just two years after the Stonewall Riots marked the start of the gay rights movement. The American Psychological Association still listed homosexuality as a mental illness until 1973. So this was an unbelievably bold move for ABC to allow this story to slowly unfold, step by step, in a way that was so thoughtful and romantic that viewers weren’t just okay with the concept — they were actively rooting for the guys to overcome their many obstacles, and end up in each other’s arms. It takes more than two years, and it’s basically the best soap storytelling that there’s ever been. I can’t wait to get through the next few weeks, and finally start writing about the real Dark Shadows, the show that we remember and love. So I don’t know what happened to that strange Dark Shadows on the other side of Parallel Time. Barnabas leaves our world next week and goes back where he came from, and good luck to him. Maybe in that other band of time, they’ll also figure out that the supernatural stuff is a dead end, and if they want the show to survive, they need to focus on real characters with real feelings, and bold story choices that keep the audience coming back for more. Or maybe they just keep doing the same tricks, until the show runs out of steam. All I know is that I’m happy we’re on this side of the border, with Claude and Philip and all of the drama to come. We have so much to look forward to. In the teaser, it takes a little bit too long for Claude to put the dagger in his pocket, and then hold out his hands to embrace Roxanne. In act 1, you can hear Maggie dialing the phone in the Collinwood foyer, after the scene has moved to Claude talking to Roxanne at the Old House. 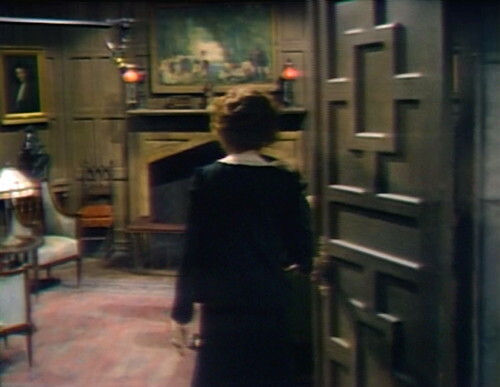 When Barnabas walks into the Old House and finds Roxanne standing in the hall, the boom mic pokes in at the top right. At the beginning of act 3, as Barnabas crosses the landing, he coughs. Also, the whole show is kind of purple today. There have been a lot of problems with the cameras recently; I’m hoping this is temporary. Claude North is played by Brian Sturdivant, who previously appeared on the show in January as the Bellboy in Mr. Best’s afterlife waiting room. 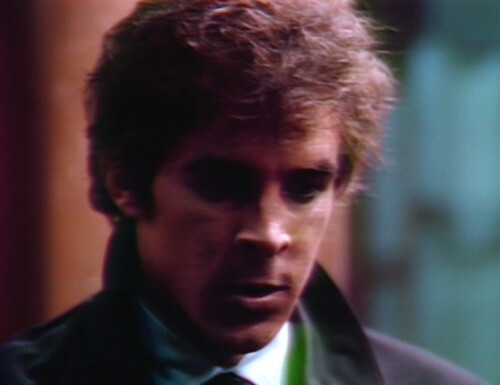 In our universe, he’s only on Dark Shadows for three episodes, and then I’m not sure what happens to him. IMDb says that in 1971, he had a small part in a Roger Corman WWI pic called Von Richthofen and Brown, and a part in a TV-movie about a social worker called The Coming Asunder of Jimmy Bright. IBDb says that in 1972, he appeared on Broadway for three months in a background role in Vivat! Viva Regina! And then I don’t know what happened to him after that. I really do actually think that he’s handsome and potentially charismatic, and I wish they’d kept him around. Today, the episode format of the show changes slightly, from a teaser and three acts to a teaser and four acts. Here’s the whole history, if anyone cares: from episode 1 to 34, the format was a teaser, three acts and a final tag. From episode 35 to 589, it was a teaser and four acts. It changed to a teaser and three acts in 590, and now it’s back to a teaser and four. This time, the first act airs immediately after the titles, with no commercial break. This is the format for the remainder of the series. The Pigweasel falls in love with Megan and makes a deal with Nichola Blair (she prefers Nikki) to become a real boy. Unfortunately Philip falls for Mr Piggy, creating a love triangle. But there were so many great characters in those first years, forgotten after the fire and the building of Northwood; if you look at Heartthrob magazines from the late sixties, you can see just how popular Jered Holmes was with teenage girls, and Your Girlfriend magazine had cover after cover of Lisa Richards – and of course almost everybody from the early years went on to such success in movies and as public figures. All those Chris Pennock Western films, Liz Eis’ singing career (oh, remember Among The Shadows, I wore out my copy of that record! ), Nancy Barrett’s long stint on Lovely Lady, and John Karlen’s surprising gift for comedy, with his Living with Jack TV series, and Anton-winning movie roles. I envy you on that side of the time rift. You wouldn’t f—ing believe who’s president in this one. Why is all this my big Deja Vu? It might have been President Selby, I don’t know. You mean you guys don’t have President Barney Frank in your Parallel America? That’s too bad. Ugh. Another column shipping Claude and Philip. Give it up already. The “romance” started as a slapfight in the Northport disco set to the Village People’s “YMCA,” and no matter how the show tried to retcon it years later into some big love story, loyal viewers can never forget how Claude made fun of poor Philip’s sweater and triggered his wool psychosis. Great romance, indeed. Oh, all that flouncing stereotypical stuff was just to bring the viewers back after that rotten vampire story. I mean, Curtis was going to try anything, and that actually worked! He fired the writers, and got in people who could write thoughtful, intelligent male\male scenes that weren’t just mincing, bitching and lisping. Just as if two guys could actually have a meaningful, monogamous adult relationship. Retcons be damned, it worked; and it changed a lot of attitudes! Is this the time band where the Beatles never broke up but the Rolling Stones did, and Jim Morrison lived on to become the U.S. poet laureate and eventually be awarded the Nobel Prize in literature? Well, the Beatles kind of broke up, in that it took a few years to get all four of them confirmed as US Supreme Court justices. It’s sad that Chief Justice McCartney died so young but, what did he expect? All he ever ate was junk food from his wife Linda’s burger joint chain. I remember those Yellow Submarine sandwiches; practically lived on ’em in my freshman year. How about those 1/3 pound bacon double cheese Walrus burgers – served with Kaleidoscope fries. Ooh and the Give a 5 Piece a Chance chicken finger platter with tangy ringo sauce. I liked the Glass Onion rings, but nowadays they don’t agree with me. Ever try the Fish & Finger Pies? And of course the Strawberry Veal For Afters, but that wasn’t around long after the Bovine Rights Act was passed. PT Danny is just as good as Classique Danny. May I offer a salute to both! Well-done, sir, well-done! Claude North definitely stirred my pre-puberty libido all those years ago. Unlike other parts of DS, I haven’t seen PT again until right now, and It took seeing Brian Sturdivant once more to finally understand why he so fascinated me all those years ago. What a hottie. I’m tingly at the thought of writing PPT! Or at least some sedatives. One thing that we have to thank the new writers that Curtis brought in, was that they knew what policemen and doctors do. Thus Inspector Hamilton was replaced by George Patterson who brought a new level of competence to the Collinsport police, turning DS at times into a police procedural, and Woodard, the new doctor that took over Longworth’s practice, who actually behaved like a real doctor (it might have been the actor’s input, as he was the son of a surgeon). This is my first time through DS and so today’s show was my first viewing of Brian Sturdivant. Perhaps he gets better, but at least as far as this episode goes, he seems to be a terrible actor. I’m not sure I’ve seen anyone manage to overact and underact at the same time. It’s like crossing Addison Powell with Craig Slocum. I have to wonder, are people confusing being his good-looking with acting charisma? I thought this was previously the case with discussions of Don Briscoe.